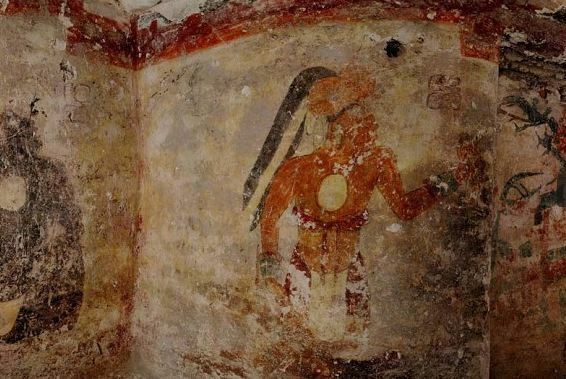 The walls reveal the oldest known astronomical tables from the Maya. Scientists already knew they must have been keeping such records at that time, but until now the oldest known examples dated from about 600 years later. Astronomical records were key to the Mayan calendar, which has gotten some attention recently because of doomsday warnings that it predicts the end of the world this December. Experts say it makes no such prediction. The new finding provides a bit of backup: The calculations include a time span longer than 6,000 years, meaning it could extend well beyond 2012. "Why would they go into those numbers if the world is going to come to an end this year?" observed Anthony Aveni of Colgate University in Hamilton, New York, an expert on Mayan astronomy. "You could say a number that big at least suggests that time marches on." The room is part of a large complex of Mayan ruins in the rain forest at Xultun in northeastern Guatemala. 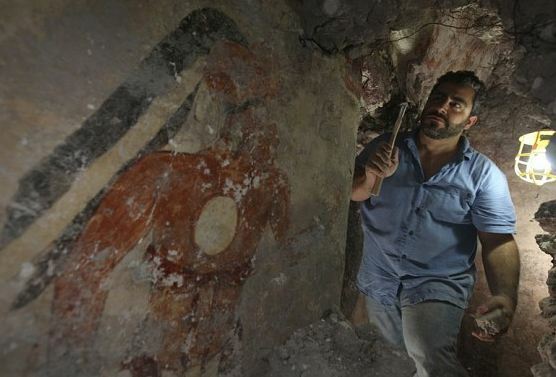 The walls also contain portraits of a seated king and some other figures, but it's clear those have no connection to the astronomical writings, the scientists said. One wall contains a calendar based on phases of the moon, covering about 13 years. The researchers said they think it might have been used to keep track of which deity was overseeing the moon at particular times. Aveni said it would allow scribes to predict the appearance of a full moon years in advance, for example. Such record-keeping was key to Mayan astrology and rituals and could have been used to advise the king on when to go to war or how good the year's crops would be, he said. "'What you have here is astronomy driven by religion," he said. On an adjacent wall are numbers indicating four time spans from roughly 935 to 6,700 years. It's not clear what they represent, but maybe the scribes were doing calculations that combined observations from important astronomical events like the movements of Mars, Venus and the moon, the researchers said. Why bother to do that? Maybe the scribes were "geeks ... who just got carried away with doing these kinds of computations and calculations, and probably did them far beyond the needs of ordinary society," Aveni suggested. Experts unconnected with the discovery said it was a significant advance. "It's really a wonderful surprise," said Simon Martin, co-curator of an exhibit about the Mayan calendar at the University of Pennsylvania Museum of Archaeology and Anthropology. While the results of the scribes' work were known from carvings on monuments, "we've never really been able to identify a working space, or how they actually went about things," Martin said. The new work gives insight into that, he said, and the fact the room had a stone roof rather than thatching supports previous indications that the scribes enjoyed a high social standing. "It's a very important discovery. We're only getting a glimpse of it" in the published paper, said John B. Carlson, director of the Center for Archaeoastronomy in College Park, Maryland. "This is an intriguing start for this discovery."